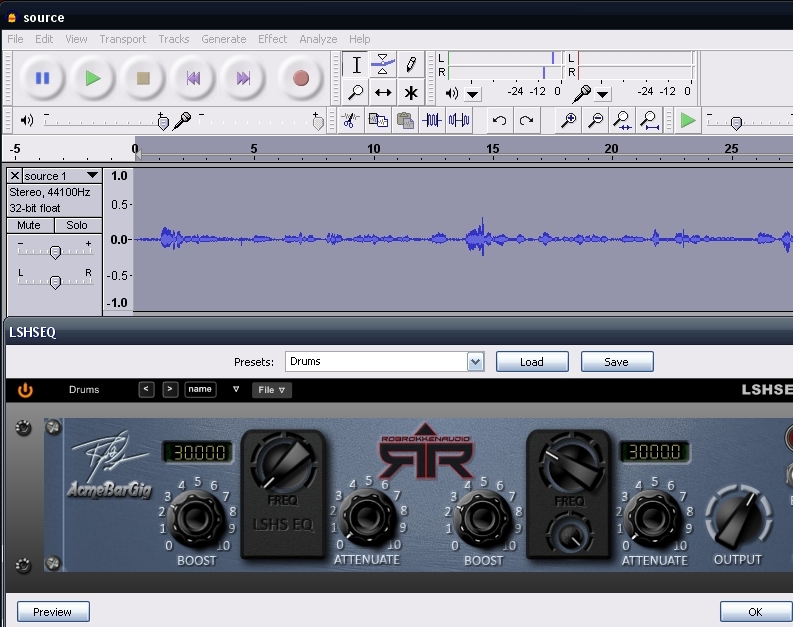 Audacity is a great sound editor and with VST plugin effects you can make your final edits and mixes sound even better. VST plugins are high quality sound processing modules, often far better than the ones included in Audacity. 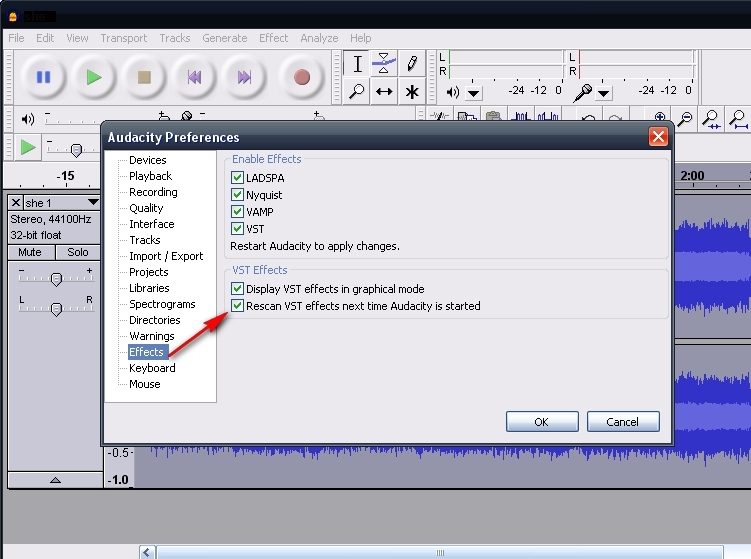 There are hundreds of free ones which you can use to enhance your audio. - Noise Reduction, Compressors, De-Essers, Spectral Enhancers- you name it. There are links to some of the better ones towards the bottom of this post to get you started. 2) Download your VST plugins of choice and place their respective DLLs into the same plugins folder. 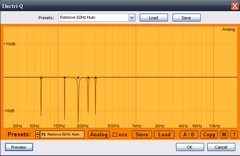 'Electri-Q' - This is a kick @ss EQ, primarily because of the slew of presets. Just get it! boost- I like this one a lot. Simple to use, sounds really good. boost is a dual-band, parallel compression effect that enhances your audio by boosting the lows and highs whilst still letting some of the original signal through to get a nice blend. 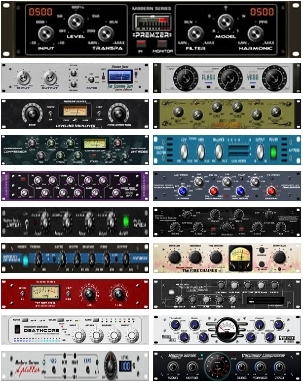 ANTRESS MODERN PLUGINS -A dozen very good audio processing plugins, perhaps a bit overwhelming if you're just starting to get a taste of VST goodness. "Quality is cool, but don't forget... Content is King!" Nice and brief. Unfortunately the zip link doesn't work. I guess the free antress vst plugins zip is enormous? It seems to be hard to find on the net. No torrent either. I maybe could mirror it. The zip is linked at the top of the page, 20.2 MB, it works from there. Probably needs a referrer from the site. 1) I don't have an "effects" portion in my preferences. 2) I don't see any kind of interface (knobs, faceplace, etc). 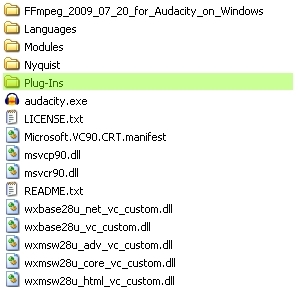 The problem with Audacity and VST plugins, is you only get a few seconds of preview. Wavosaur is also free and is a better candidate for VST plugins in my opinion. You can preview the full song as you make adjustments. There's no reason not to upgrade to 1.3.x (currently 1.3.11), at least to try it. 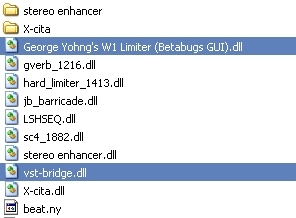 The "beta" designation of 1.3 is pretty conservative. A very few people have had instabilites, but you'll find that out immediately and can revert. Otherwise there are many improvements and enhancements over 1.2. 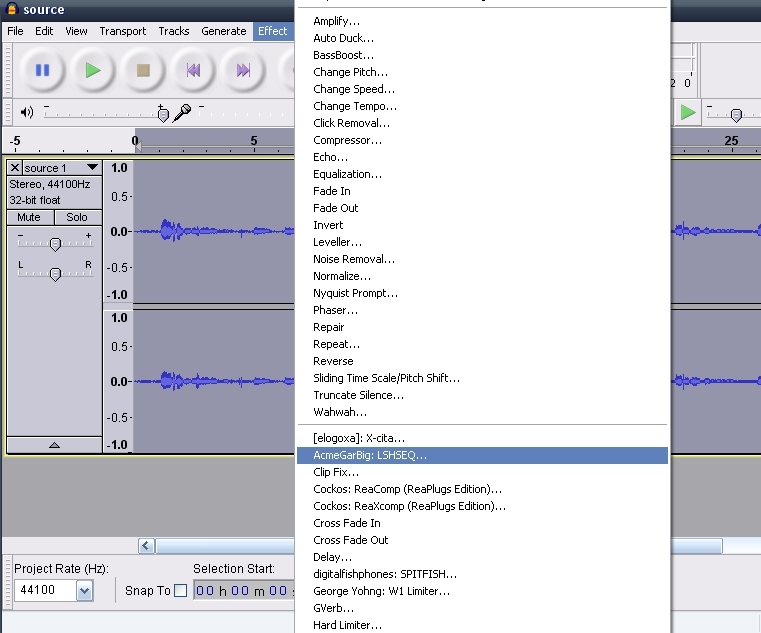 The problem with Audacity and VST plugins, is you only get a few seconds of preview. Default is 5 seconds, change it to whatever you want. If I want a longer preview I select a region, apply the effect, play it, and Control-Z to undo. That way I can also see the change in the waveform, which can be helpful, the "preview" doesn't do that. Yeah, I figured that out after I made my post. You still have to wait till it renders before preview. Great guide just the same! You can also use these VST plugins in Vegas as well as other audio editors that support VST plugins. If you could preview without rendering, that would be pretty amazing. there anyway i could get the lame mp3 decoder? ??? click on the highlighted link in your post and d/l then install it? next time make your own thread. don't dig up old posts that have nothing to do with your problem. howdy and welcome to the forum! a little late i know. try reading the rules before posting next time. ???? Any multimedia player that supports VST plugins?